"These jerk chicken wings were so flavorful, so different, and so additively delicious, that I may have eaten my last Buffalo wing. Okay, I didn't mean that, but these really are amazing; a perfect balance of sweet, sour, salty, and spicy. I'm usually pretty casual about you changing my recipes, but I'm going to have to insist you not change any of the key ingredients, which are, every one of them." 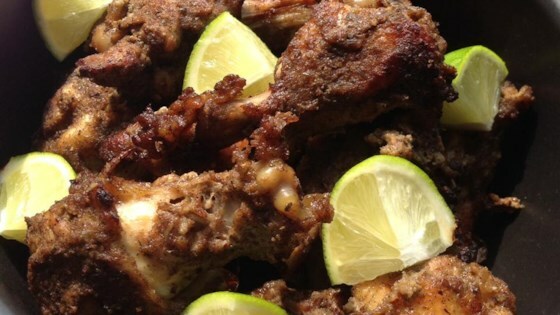 Caramelized chicken wings marinated in spicy Jamaican jerk seasonings. You can marinate the wings for 2 hours at room temperature, turning every 15 minutes, instead of marinating in the refrigerator overnight. We found these too spicy, but that might be because I subbed a different kind of pepper. Will try again with fewer peppers. I really loved this recipe. It is very spicy but that is what makes it taste good. I added some shadow beni since I did not have much thyme. It worked really well. Great recipe. This is the closest recipe I've tried that comes close to the real authentic jerk flavor.